If you could select one NHL franchise’s core of players under the age of 24 to build around, which one would you pick? That, in a nutshell, is the thought behind TSN’s annual Core 4 Under-24 analysis, which returns Wednesday with a special hour-long edition of 7-Eleven That’s Hockey (7 p.m. ET on TSN1/4). 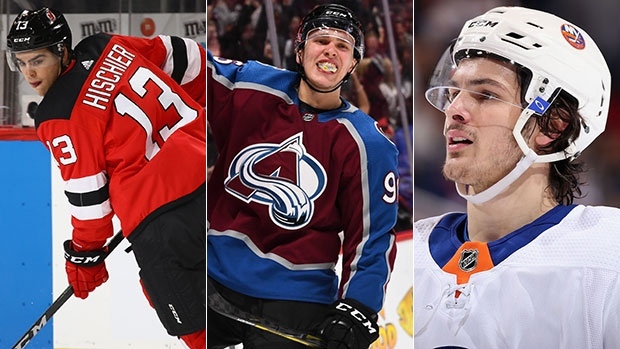 On the show and on TSN.ca, we will be break down and rank the top four players from each franchise who fit that criteria, then rank those teams for the third year in a row. We’ve taken it a step further this season by adding individual letter grades to all 124 Core 4 players in the NHL. That doesn’t mean we’ve been perfect along the way. In order to get where you’re going, you need to know where you’ve been. That’s why we conducted a self-audit. We’re not afraid to admit where we’ve made mistakes. Scoop: There was never any doubt about Mikko Rantanen’s ability, but the notion that he would blast off with 84 points last season – and that the Avalanche would make the playoffs after a historically bad 48-point season – wasn’t on anyone’s radar. Not only that, but Nathan MacKinnon nearly eclipsed his 2016-17 point total (53 points) in the first half of last season (52) on the way to being voted runner-up for the Hart Trophy. MacKinnon and Rantanen have now established themselves as one of the premier duos in the NHL, putting them in line for a well-earned year-over-year jump in the rankings. Scoop: In a normal year, the 52 points that Nico Hischier put up as an 18-year-old might have been enough to win the Calder Trophy. He did just about everything the Devils asked of him. With the explosion of Elias Pettersson, it’s now clear that Hischier is not the No. 1 player of the 2017 Draft and he may ultimately not even be the second best. For those reasons, coupled with the fact that the Devils do not have another ‘A’ grade prospect in their Core 4, the more accurate position for New Jersey in last year’s rankings was quite a bit lower than where they ended up. Scoop: Mathew Barzal was off to an impressive start at this time last year in his rookie season, with 14 points in 17 games. The question then was whether he could keep it up for the remainder of the campaign and avoid the rookie wall. He ended up matching Evgeni Malkin for the most points (85) by a rookie in the 21st century and ran away with the Calder Trophy. His game-breaking ability, and fact that he’s been able to start strong again this season without John Tavares shielding his matchups, proves that he is an exceptional star in this league worthy of top-status Core 4 billing. The Islanders are so deep, with franchise netminder Ilya Sorokin and quality draft picks, that this year a player like Anthony Beauvillier has fallen out of the ranking through no fault of his own. Find out where these three teams now sit in the Core 4 Under-24 rankings, plus all 28 others, when the 2018 version is released on Wednesday morning.